I admit it- I had a lot of fun writing my latest novel, Romancing Robin Hood. It gave me the chance to take a self indulgent trip down memory lane, and dig out all my PhD notes on the ballad history behind the Robin Hood legend. Although my novel is a modern contemporary romance, it also contains a second story- a medieval mystery which has more than a hint of the Robin Hood’s about it. The earliest balladeers sang tales of Robin Hood long before they were written down, and audiences through history have all had different ideas of what Robin Hood was like in word, action, and appearance. Every writer, film maker, and poet ever since the first tales were spoken, has adapted the outlaw figure to fit their own imagination. The earliest mention found (to date), of the name Robin Hood appears in the poem The Vision of Piers Plowman, which was written by William Langland in c.1377. 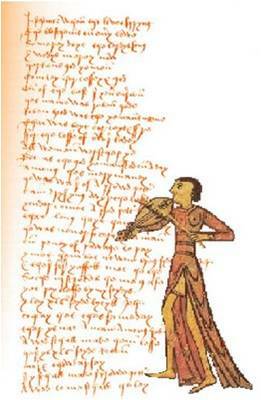 A long ballad, Piers Plowman was a protest against the harsh conditions endured by the poor in the Fourteen Century. Not only did it mention Robin Hood, but makes reference to he outlaw gang, the Folvilles, who research suggests were an influence on those whose exploits wrote the Robin Hood ballads. The Folville family were incredibly dangerous, influential, and had great impact on the Midlands of the UK in the Fourteenth Century. I’ll be introducing this family of brothers to you properly very soon; for they are something of an obsession for historian Dr Grace Harper- the lead character in Romancing Robin Hood. 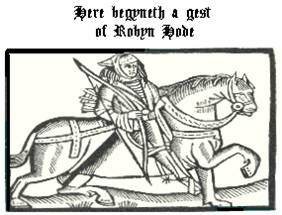 In 1450 the earliest single short ballad, Robin Hood and the Monk, was committed to paper, but it wasn’t until 1510 that the original story (Lytell Geste of Robyn Hode), was recorded in its entirety. With the arrival of the printing press in Tudor and Elizabethan times, all of the most popular stories we recognise today were recorded for prosperity. Some of these stories had medieval roots, but many were were brand new pieces. The Tudor audience was as keen for fresh tales containing their favourite heroes as we are today. These ‘new’ tales included Robin Hood and Gisborne (c.1500) and Robin Hood and the Curtal Friar (c.1550) – who became known as Friar Tuck. – in 1497 Roger Marshall called himself Robin Hood, and lead a riot of 200 men in Staffordshire. – in 1509, ten Robin Hood plays were banned in Exeter by the city council, as they had become a public nuisance. Robin Hood’s most famous Tudor fan was Henry VIII himself. In fact, apart from hunting, eating, and getting married, Henry’s favourite hobby was acting. Sometimes he dressed up as Robin Hood. The king would wear a mask, and his audience had to pretend they didn’t know it was him, and had to look surprised when he revealed his true identity at the end of the play. Thank you for letting me share a little of my Robin Hood passion with you today- be warned, there will be more on the subject very soon…. Can’t wait to read it! I did a four month contract performing at a Medieval Banquet, it was so painfully historically inaccurate that I learnt to hate the place. It has really made me enjoy plays and books where history is actually studied and used correctly!! Your book sounds really interesting, so can’t wait to get my teeth into it! I have a question, Ms Kane. I was reading, just the other day, that Robin was gay. as much as i find the idea of Robin being gay, my favorite Robin is Sean Connery in Robin And Marian. http://www.imdb.com/title/tt0075147/ Audrey Hepburn could have turned me straight. i watch this movie at least once a year and weep every time.